2. Draft a proposal for an increase in the representation of faculty of color in the form of a 2 year, 5 year and 10 year plan. 3. A formal apology to the LC Black Lives Matter organizers for his absence during the incident on the night of November 20, 2015, and the lack of communication thereafter. 4. 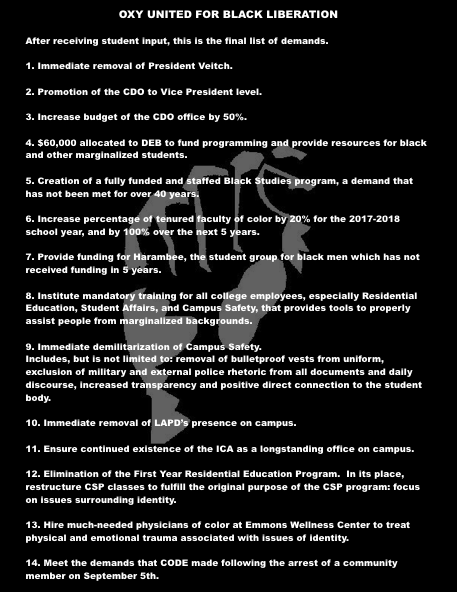 A verbal commitment to fulfilling LC Black Lives Matter and #WalkTheTalk demands. 5. An admittance of his failure to prioritize the safety and security of students of Color during his tenure as president. 6. A formal statement to the Dallaire Scholarship donors, Roméo Dallaire, the UWC International Office, the Davis Foundation, and the office of International Students and Scholars reaffirming his commitment to the safety of all international students. 10. Lewis & Clark College was built upon stolen land through the genocide of Indigenous and Native American peoples. 11. Through its name, Lewis & Clark College honors the lives and deeds of owners of enslaved peoples. 12. Lewis & Clark College replicates the assertion of, and benefits from, the legacy of Anglo-American white supremacy. 13. Institute mandatory, campus-wide open dialogues every four years beginning academic 2015-2016 school year regarding the personal cultural, historical, and political significances of the individuals Sacagawea and York, and the significance of the statues Sacagawea and Jean Baptiste and York: Terra Incognita on undergraduate campus property. 2. Campus Safety’s appearance and the culture of fear and insecurity on campus. 3. The implementation of mandatory implicit bias workshops and trainings conducted every semester. 5. The creation of one open forum per semester or academic year discussing issues surrounding Campus Safety, allowing students an environment in which they can voice concerns or visions for the future, as well as to bring awareness to the rights that students have.